If you follow me on social media you will be familiar with the regular bargain finds I share from local discount store Home Bargains. It's one of my favourite places to shop all year round and when it comes to the festive season it just gets even better! The best thing to me is that they often have different products in everyday so I try to nip in on the way home from work a few times a week. I've bought lots of toys from there for both my children and saved myself quite a few pennies in the process! In the last month I've managed to buy a gorgeous Frozen Elsa style dress up costume for just £5.99, some great Wow Toys at less than half RRP and Marvel Avengers action figures at just a third of the RRP! 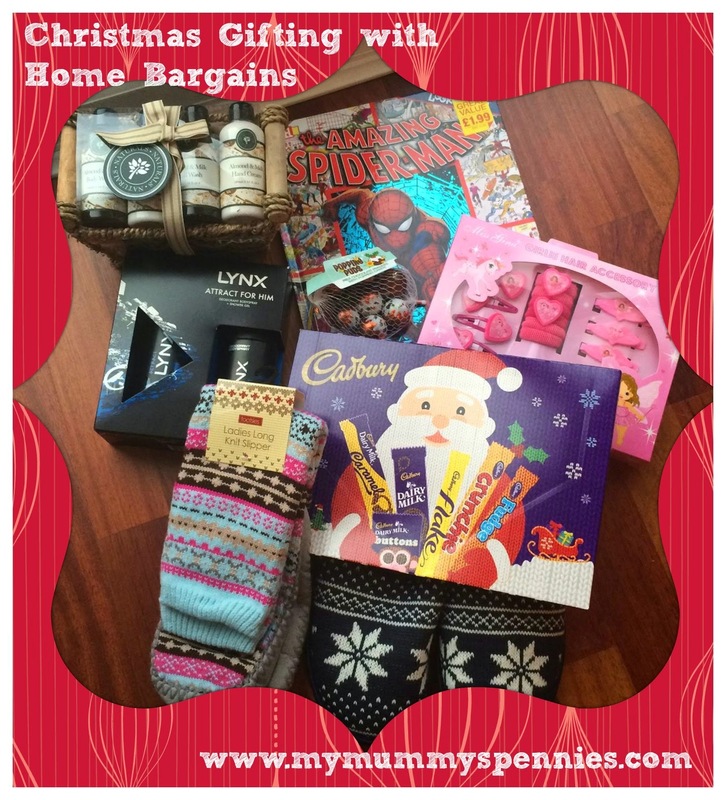 The lovely folks at Home Bargains sent me a hamper of goodies from their current stock to showcase the fabulous selection of gifts they have on offer at this time of year. If you are looking for last minute gifts for family, a Secret Santa present for work or for treats to fill up those stockings then you won't be disappointed! With great value toiletries sets for Aunts and Uncle, slippers for Mum and Dad, hair sets for little girls and activity books for boys, not to mention a variety of delicious chocolates you get more for your money at Home Bargains this year! The above items are all less than £5 each! These are just a taster of the bargains that your local store has to offer so why not pop down to yours today? Great bargains! I love home bargains!